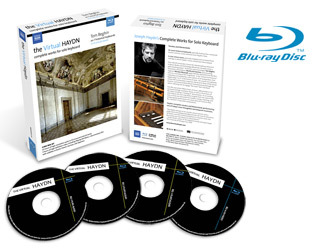 The Virtual Haydn now exists as a four Blu-ray Disc box set released by Naxos, leading label and distributor of classical music recordings. Fourteen and a half hours of music are divided over three dual-layer Blu-ray discs with an attractive screen display while the music plays, either in high-resolution stereo or 5.0 surround. A fourth BD contains additional video material: five video performances as well as a feature-length documentary Playing the Room, with subtitles in Dutch, English, French, German, and Japanese, directed by Robert J. Litz and Jeremy Tusz, offering a unique window into the “making of” these recordings. Finally, the 7 x 9 “musical clock matrix” allows the listener to freely combine instrument and room, for a total 63 possible combinations. Each instrument and room comes with a gallery of images. Mookai Communications (Montreal) signed for the beautiful artwork. Plasma Postproduction (Montreal) authored and mastered the Blu-ray discs. 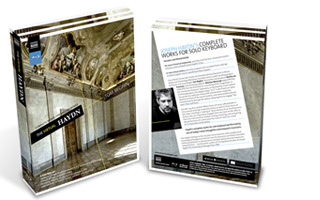 © 2009 The Virtual Haydn. All rights reserved. Concept and design by Mookai Communications.